More than 40,000 Ivorians have crossed into Liberia in early 2011 because of political instability in Ivory Coast. Some 25 people share a mud house in this village. CRS is building shelters for the Ivoirians refugees and will also support host families. Hundreds of thousands of Ivoirians have already fled their homes to escape the violent post-election clashes in Côte d’Ivoire. Many experts believe Côte d’Ivoire is on the brink of civil war. “There is a generalized fear within the population here that makes us think the situation could escalate”, said Jean Djoman, Director of Human Development at Caritas Côte d’Ivoire. As the world’s attention is mainly focused on the more recent events in Libya and Japan, Côte d’Ivoire seems to have become a forgotten crisis. In some villages in poor neighbouring Liberia, the population has doubled over the last weeks. 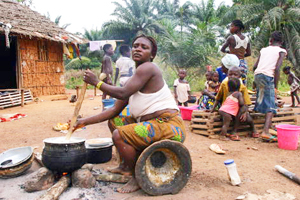 Local communities hosting the arriving Ivoirians have shown tremendous solidarity, but are unable to cope by themselves with the massive influx of people. Caritas is providing food, health care, sanitation and more to thousands of displaced people inside Côte d’Ivoire and in Liberia.